Joanna Wilkins, is a Sussex Archaeological Society education officer, based at Anne of Cleves House, where she regularly gives visitors advice on how to be a successful Tudor housewife. For this evening will be taking us back a little further in time, to the medieval period. Unfortunately the church building lacks some key medieval cooking facilities, such as a large open-hearth cooking fire, so this cannot be a hands-on demonstration. Long-standing members will recall that Joanna has spoken to us on two previous occasions; about Anne of Cleves House and also about William de Warrenne. She is an excellent speaker. This hand-coloured Edwardian postcard of the Lewes cattle market was published by W. Brooker of Sussex Gardens, Eastbourne, and was posted in 1907. It shows the cattle and sheep market in progress, with buyers examining lots. The shed in the foreground carries an advertisement for Lloyd & Son, gunmakers. This postcard shows H.R.H. 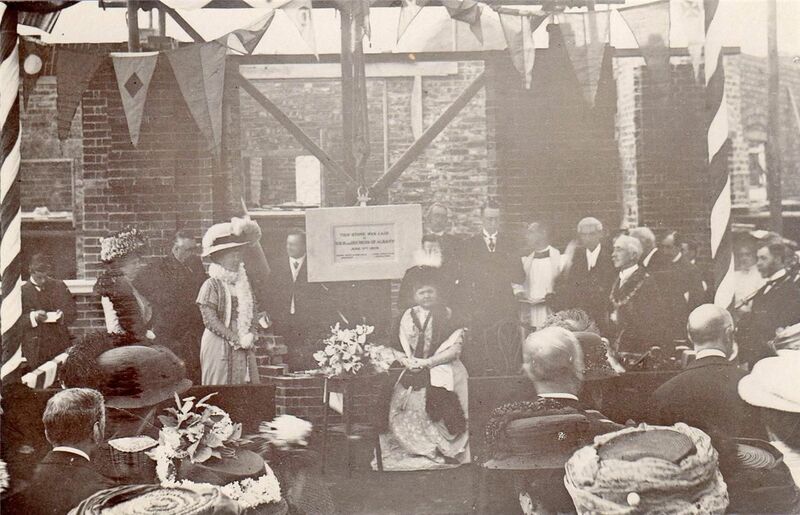 the Duchess of Albany laying the foundation stone of Lewes Victoria Hospital in 1909. The mayor (Alderman George Holman) stands to the right. 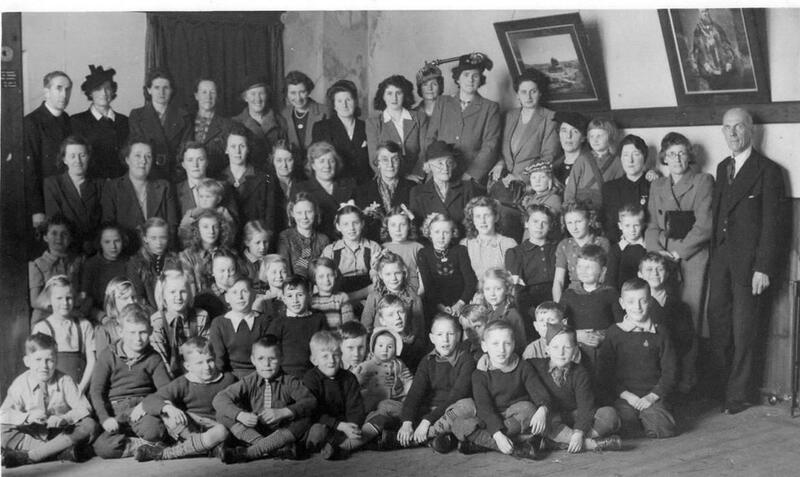 This postcard-sized photo has on the reverse “The Dutch children who came to Lewes in Feb 1946. Mrs Rainer’s party”. In 1818 the Parliamentary Select Committee for the Education of the Poor conducted a survey of the school facilities available in parishes throughout the kingdom. The replies were published by Parliament on 1 April 1819. The response from St John-under-the-Castle parish, population 1,126, was made by the rector, the Rev P.G. Crofts, a gentleman who lived in some style at Malling House. He reported that the parish had a school based on the Lancastrian system, supported by voluntary subscriptions and open to the whole town, in which about 400 boys and girls were instructed. There was also a day school for children, paid for by their parents. His conclusion was that the poor had sufficient means of education. The response from St Michael’s parish, by the Rev G. Shiffner, reported that there were two day schools and one Sunday school, supported by voluntary contributions. He too considered the poor had sufficient means of education. The curate, Thomas Airey, responded for All Saints parish, population 1,427. He reported a Sunday school containing 70 girls and 55 boys who attend the Lancastrian schools in St John’s during the week. There was also a Sunday school at a dissenting place of worship called The Tabernacle at which the number of children on the books was 124 boys and 111 girls. 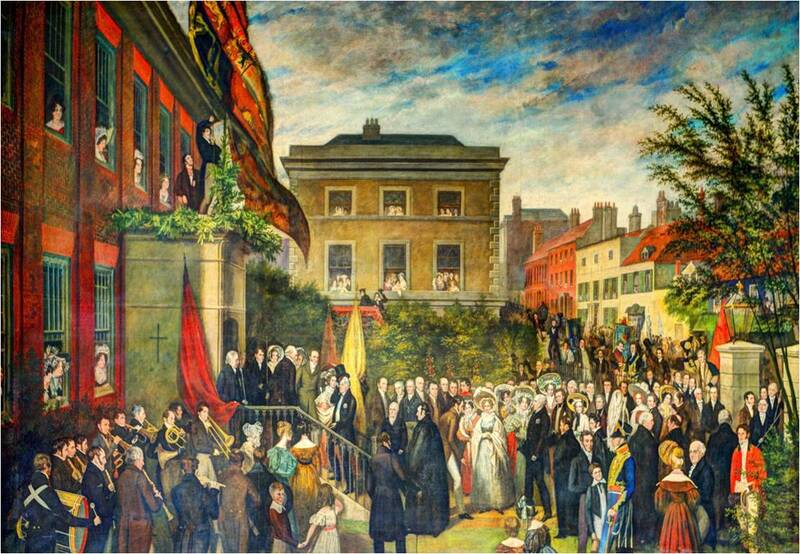 There was also an establishment on the new system in an adjoining parish to which many of the principal inhabitants of All Saints were subscribers, which enabled the children of the poor of both sexes to be educated. The churchwarden replied on behalf of the parish of St Peter and St Mary Westout, population 918. He reported a free grammar school in which 12 boys are taught by a master, who received £25 p.a. accruing from lands in the parishes of Hamsey and St John the Baptist, Southover, £3 p.a. from a dwelling house in the parish of St Michael’s and £53 5s 0d interest in money in the public funds. The master was besides provided with a house in which he resided, a schoolroom, yard and garden, the same being portion of the endowment vested in feofees. A few of the poor received education at a subscription school on Mr Lancaster’s plan in the parish of St John-under-the-Castle, but many were without the means of education, and were desirous of possessing them. The Rev W. Courthope, rector, replied for St John the Baptist, Southover, population 543. There were four small schools containing 52 children, all under 7 years of age. He thought the poorer classes had not the means of education, and were desirous of possessing them. The Cliffe parish response was also from the rector, the Rev J.Lupton. The population there was 1,258. There were several schools containing 103 children, and a Sunday school, chiefly supported by Dissenters, in which 220 were instructed. He said the poorer class did not have the means to educate their children and would be glad to obtain them. As minister he much regretted that he had not been able to establish a Sunday school on the principles of the Church of England. The final response was from South Malling parish, population 443. The respondent was W. Courthope, the curate – probably the same man as the rector of Southover. In this parish there was no provision whatever, and no comment from the curate. LEWES. Lewes School of Art.—The works by the students of this School, which were sent to South Kensington in April for examination, have obtained a National Bronze Medal and fifteen third Grade Prizes. These awards have been made by Her Majesty’s Art Examiners. 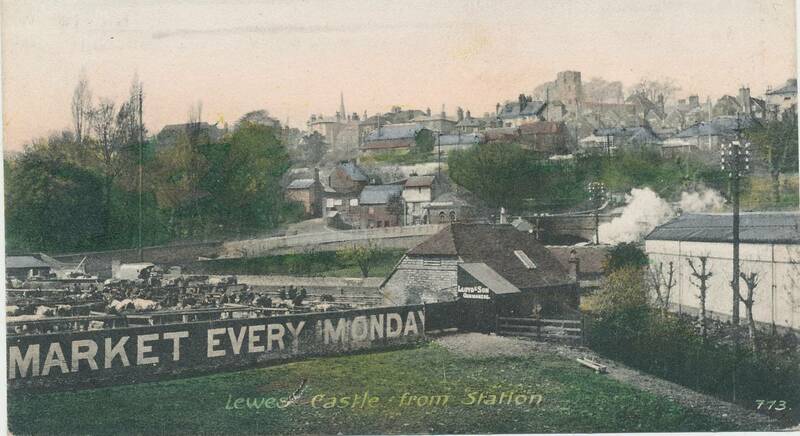 This entry was posted in Agricultural History, Art & Architectural History, Cultural History, Economic History, Education History, Lewes, Local History, Social History. Bookmark the permalink.